Jen and the Stingrays. Sounds like an awesome band name. For the last two weeks we were rocking with Jen Tanner here in the Cayman Islands. She’d just graduated from Weber State and decided she needed a tropical vacation as a graduation present to herself (good choice Jen). It’d been 7 years, so a reunion was definitely in order. Natalie and I were looking forward to her visit. Old friend aside, Jen is the first visitor we have and her arrival gives us an excuse to do some of the touristy things on island that we have been putting off (saving for friends, because if you do ALL of the touristy things, the island gets really small, really quickly). After all, there were beaches to snorkel, foods to eat, and a perpetual sunburn to work on. But first a note about Jen. Back when I knew her in Rexburg she was already one of the coolest and most chill people I knew. We met through work at the Writing Center and when I found out that she was a fellow Canadian from British Columbia, we were instant friends. Jen has a super power–the ability to immediately adapt to nature and find a way to chill out and relax. In college this meant a blissful smile as she walks beneath birch trees, or grooving to the bass of dubstep. In the Caribbean this means Jen finds a way to float sitting up within minutes of getting into the 80 degree water. Her head and shoulders are above the water and her toes stick up. She waves at me and floats happily along the waves, while the same wave hits me full in the face as I struggle to tread water. She defies floating logic. 2009 – classic Jen chill, and me trying to be cool. Jen’s chill means she’s a low maintenance house guest with only one thing on her agenda: the beach. Good thing there are a few of those in the Cayman Islands. We take Jen to Rum Point with Dan and Olga. Rum Point is a mellow beach, a privately owned section of beach on the North Side of the island. Carefully arranged on the shore are beach loungers in long rows, hammocks tied between palm trees. There are huts to order food and drinks, rent kayaks, paddle boards and wave-runners. A pier extends into the water where tour boats take tourists to explore the delights of the sea. Rum Point is designed for a well spent day at the beach. Dan settles in to a lounger and pulls out his Kindle, ready for a good book. Olga teases him, poking and prodding at him to go play in the water. Dan insists on his book. Natalie and Jen just look happy to be at the beach. But I feel that sitting around isn’t enough.Today we are tourists, so we must do touristy things. And what is more touristy than swimming with stingrays? A glass bottom boat takes Natalie, Jen, Olga and I out to a spot the locals call stingray city. Our boat is captained by a dark skinned Caymanian, his first and second mate are another Caymanian and an Irishman. A middle aged man with a head of white hair and a thin goatee sits next to Jen. We share the boat with a Mennonite family dressed in modest clothing–fully covered up even for water activities. I’m impressed with their dedication to modesty in tropical weather. Apparently I’m over dressed for this party. Stingray city is nothing like what I imagined it to be. Months ago Ryan Cooley said that on a cruise ship visit they got to swim with stingrays. When I imagined going swimming with stingrays, I thought it would be in a sterilized Sea World type experience. A swimming pool with fish. I did not expect a shallow sandbar in the bay of the island. As the captain brings the boat close to the sandbar, I see that it’s a popular destination. Six boats are float in the shallow waters, and groups of people swim nearby. There’s a buzz of excitement in the air, a murmur of voices that can be heard over the waves breaking in the distance. The captain brings our boat to a stop some distance away from the groups of people. He and the crew throw anchors into the water and they extend a ladder into the water. We jump into the water snorkels in hand. We’re excited and we dive into the turquoise water looking for signs of stingrays. I find a conch shell and retrieve it for everyone to see. I feel like a kindergarten student sharing a favorite toy truck. The conch tentacles slither back into shell as I hand it over to Natalie. Startled, we almost drop it back into the water. 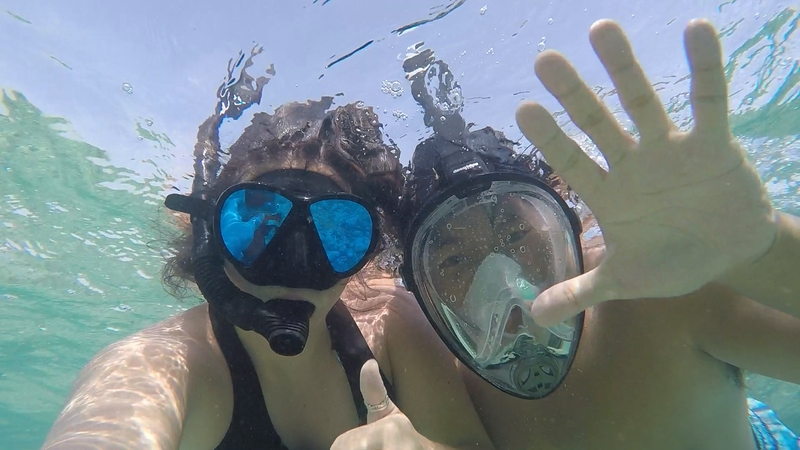 Seconds before water floods into our mouths because we didn’t know how to use snorkels. Mr Conch and his tentacles are deep in his shell. “We’ll be getting the stingrays to come over here, they love the food,” the Irish crewman tells us as he swims away. We continue to dive into the water, relishing the warmth. A cow fish swims between us. In between grins of delight I wonder if playing with stingrays ever gets old (probably not). This is about as close as you’ll ever get to seeing Natalie squee in delight. If you ever want to get her excited, bring an animal friend. There’s a well documented joy in reuniting with old friends–especially after a long time. How much does a person change over a year? Two years? Seven? We don’t necessarily notice the impact time has on our personalities until the reappearance of an old friend holds up a mirror of reminiscing. After the dust of memories have settled it’s incredibly gratifying to me to find how little some of my close friends have changed. It’s a reminder to me of why we became friends in the first place.